Even if you tried, you could never count the number of times that someone has told you some variation of the line “I’m praying for you.” It might be something dismissive like “Just pray about it,” or the bumper-sticker-worthy “Prayer changes things.” The idea that prayer is important is deeply engrained and important is accepted even by those who would not consider themselves religious. We believe that prayer reaches God’s ears and that, with infinite wisdom, God grants or denies the wishes of our hearts. Some people believe that our prayers can actually impact that way that the universe plays out – that if we plead our case, maybe we can change God’s mind about how a loved one’s illness progresses or which potential employers call back inviting us for an interview. I am not one of those people. And, I still believe that prayer is important. If I think about my own experiences, I have no evidence that prayer has ever changed anything around me. There are people who have told me that they have prayed for me; they seem to think that it has made a difference. I can’t point to anything in my own life, though, that seems to have been influenced by my prayers. I’m suspicious that a version of confirmation bias plays a role in how we think about prayer as well. If we pray and the thing we want to change actually changes, then we attribute it to the fact that we prayed. If the thing doesn’t happen, then we have an out by saying that it wasn’t God’s will or part of God’s timing. Beneath these ideas is and understanding of God that seems trivialized and transactional, and too easily swayed to care about our own selfish desires. When we pray, we have the opportunity to express gratitude. Like meditation, the regular expression of gratitude helps foster an overall sense of positivity. For me, vulnerable to regular fits of cynicism, expressing my gratitude for the simple things helps me to stay grounded, centered, and keeps me light. Gratitude as a practice has been used by psychotherapists to help turn the tide of negativity that can shipwreck client’s desire to make changes. Being grateful for what we do have is a far better way to live than feeling entitled and not getting what we want. Prayer provides a way for us to speak aloud our deepest hopes and dreams. It is a way to verbally remind ourselves what character traits we stand for and that we want to be evident in our relationships with others. Even praying in a group has value. It has the power to synchronize individuals, orienting them towards an idea and motivating them to act. Just like you and I, groups often need to speak aloud those characteristic they want to demonstrate. They often have emotions that need to be processed and gratitude that needs to be expressed. Prayer can strengthen community. Maybe prayer isn’t so much about God as it is about us. Like so many things, this idea can feel disruptive when you first consider it. We are taught to pray, without ceasing, for the things that we want, to ask forgiveness for the things that we are sorry for. We are told that God hears and answers all of our prayers. But what if the way that we interpret God’s answer says more about our own degree of self-centeredness? Maybe God is answering our prayers in such a way as to point out how selfish those prayers might be. Instead of being a disruption, it has actually become freeing for me to think that our prayers have no impact on whether God chooses to intervene. If God was more responsive to the American soccer mom’s prayer for a parking spot close to the entrance at the mall than to the mother in Syria whose daughter was just abducted by ISIS, there’s no way that I would ever follow that God. I’m not even sure I would ever talk to that God. Prayer is at it’s most effective when it’s directed inward. It’s not about changing something about the world out there but acknowledging that it can have a profound impact in our interior spaces. So I pray. I meditate. I sit in silence. I pray that I would become a more kind, more compassionate, more generous, more inclusive person. What are your major hangups with prayer? If God doesn’t listen – or isn’t real – what is the point of spending time reflecting or meditating? What if all you did was take a couple of minutes a day to say aloud the things that you’re grateful for? How do you think you would change? A close relative of prayer is the idea of mindfulness. There are great meditation and mindfulness apps for iPhone and Android that are worth checking out. Download some and integrate them into your daily routine. 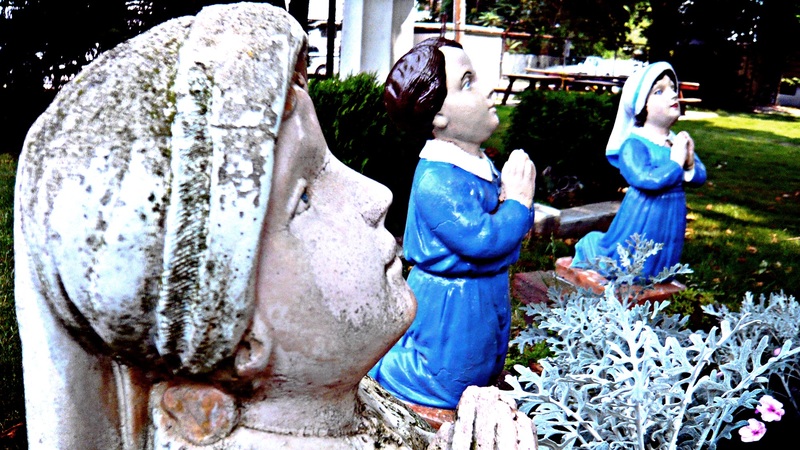 Photo Credit: “Praying Statues” by Jason Eppnick is licensed by CC BY 2.0.